By popular demand we have reopened the interest-bearing account for a limited period. Please remember it is only open till mid-December 2018 and this particular savings plan will not reopen until the New Year 2019 so, if you want a great return on your savings this could be for you. Find out more about the interest-bearing Platinum account. This week the Credit Union movement worldwide was celebrating international Credit Union Day and 70 years of service – and we joined in. There are over 68,000 credit unions in 109 countries and over 231 million members worldwide, and growing every day. 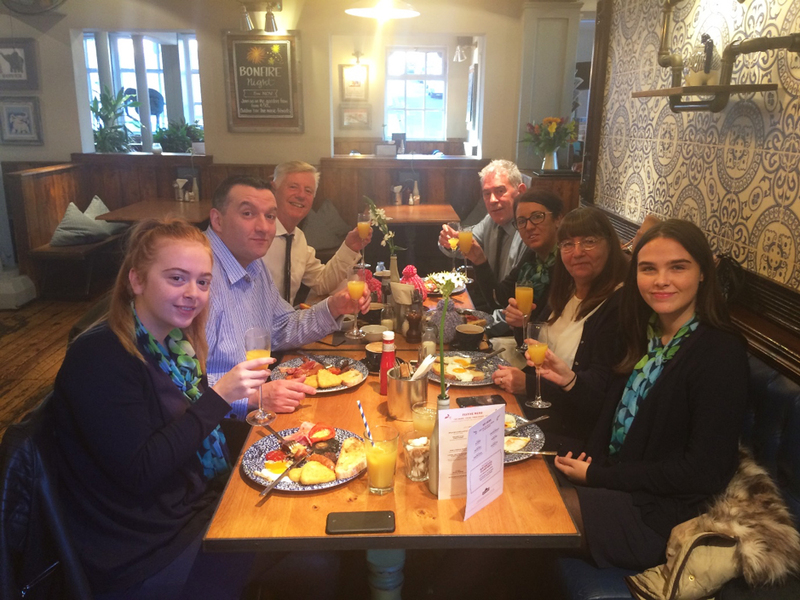 Here’s your staff at Riverside Credit Union celebrating this event by having a hearty celebratory breakfast prior to opening for business. You may have noticed from our Facebook and Twitter posts that for your convenience, we have extended the “Christmas Loan” closing date until the 16th of November. It’s still a good idea to apply as early as possible because demand is always high this time of year and leaving it till the last minute can delay your payment. As I write the new server is being installed and, you’ll be pleased to hear, backs up with unlimited file space to two different off-site locations! Since the attempted security breach on the old server we have been working evenings and weekends to reinstall all the data, frozen on the server since the “ransomware” attack on September the 3rd. Your staff at the Riverside Credit Union have processed over 58,000 paper transactions by hand to get things back on track. The on-line and text service are also now up and running. We have commissioned a new local company called Aabyss to provide enhanced cyber security and protection of the data we hold. They are leaders in their field and will be able to provide us enhanced security as we get on with our expansion plans.